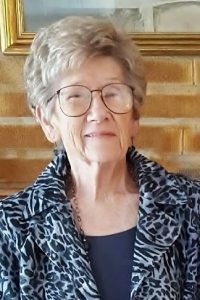 Marilyn, "Sue" Eilers, 79, of Schuyler, died at her home on Saturday, November 12, 2016. Funeral Service Thursday, November 17, 2016 2:00 P.M.
Visitation Wednesday 4-7 P.M. and Thursday 12-2:00 P.M.
Marilyn "Sue" Eilers was born November 8, 1937, in Schuyler, Nebraska to David and Ruby(Scott) Legler. She attended Schuyler Schools and graduated from Schuyler High in 1955. She then attended Wayne State College. On November 17, 1962, she married Vernon Eilers in Fremont. They lived in Schuyler and Sue was a proud mother and homemaker. She later worked for Johnnies Steak House, Bosh's Restaurant and the Schuyler Hospital. She was an excellent cook and loved to clean. On "occasion" she was known to visit the boats in Iowa. She was happiest spending time with her family. Sue is survived by her husband, Vernon of Schuyler, daughter Shelly(Tim) Noonan of Schuyler, son Hayden(Andra) Eilers of Columbus, a brother, Bill(Pat) Legler of Fremont, four grandchildren;Aaron, Ashley and Clayton Eilers, Zachary Noonan and two great-grandchildren, Isaiah and Talon Eilers and many extended family members. She was preceded in death by her parents, four sisters;Betty Bohaty, Dorothy Morbach, Pat Vanicek and Marjorie Mihulka and two brothers David and Leonard Legler.